Please join her for 15 mile round trip, along the Monmouthshire and Brecon Canal. Meeting at Brecon Basin to set off at 11am. 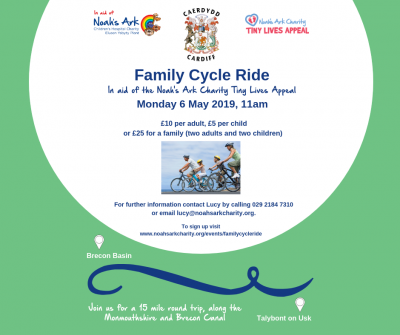 Please contact us if you would like to sign up but would only like to cycle one leg of 7.5 miles as this will be possible. All proceeds will go towards the Noah’s Ark Tiny Lives Appeal which funds life-saving equipment and facilities for families as part of a project to develop and expand the neonatal intensive care unit. For further information contact Lucy by calling 029 2184 7310 or email lucy@noahsarkcharity.org.